This page is about the aircraft B-25J-20. 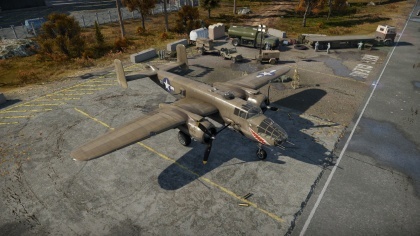 For other uses, see B-25 (Family). The B-25J-20 Mitchell is a Rank III American bomber with a battle rating of 4.0 (AB) and 4.3 (RB/SB). It was introduced in Update 1.29. The air frame makes this plane a particularly difficult target to bring down, however there are four main blindspots to be considered: Level with the leading edges of the wings, the complete underside, and each side in the rear presented by the twin tail. These are the easiest areas to kill an opposing B-25. With a max speed of 250 MPH under ideal conditions and a max air frame speed of 360 MPH, The B-25 is relatively fast for a bomber, but while climbing, can go no faster than 175 with optimal pitch. The twin engines makes for good acceleration, and allows the plane to get to an airfield to land, given you are at altitude and can maintain airspeed. This plane makes a great strategic bomber, but its wings make for nice large targets. The best way to ward off enemy fighters is to bank in toward them, giving your top gunner a chance to damage them before they can cause any real damage. Always try to fly at treetop level to cover the blindspot on the underside, or fly with bombers that have belly gunners, so you are fully covered. Also try to fly with friendly fighters, as they will prove invaluable to your survival. If you wind up with an enemy fighter or attacker on your tail, reduce engine power and adjust trim so you retain level flight, but give all rear facing gunners the ability to damage your opponent. Never fly in a straight line while fending off attackers!! Very effective front facing armament of 6 x 12.7 mm machine guns allows for engaging enemy bombers at the start of the match, or incoming fighters. Heavy defensive armament on both left and rights sides and especially on the rear. Can be used as both a tactical and strategic bomber. The belly of the aircraft is a massive blindspot in the aircraft's defense. Poor climb rate and energy retention. 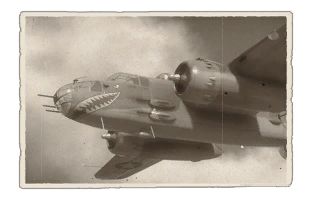 For the most part, the offensive armament will only be useful in attacking enemy bombers, ground targets, or engaging fighters head-on, as the plane is too unmaneuverable for any real dogfighting of any kind. The Elevator can be shot off by an enemy plane easily. This can cause it to become uncontrollable in certain situations. However, it can still be controlled by operating flaps, or adjusting engine power.